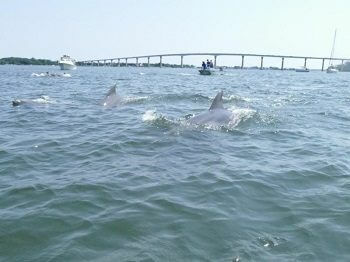 Little is known about how often dolphins come into the Chesapeake Bay. Dr. Helen Bailey and her team have been frequently detecting dolphin calls in the Bay and citizen scientists have reported more than 1,000 dolphin sightings on Dr. Bailey’s newly launched Chesapeake DolphinWatch mobile app and website. In this talk, Dr. Bailey will present what she has learned about the Bay’s dolphins so far, describe the sighting app, and explain how you can participate in this research effort. Dolphin photo by Phil Yunger. This is a free event, supported by Cove Point Natural Heritage Trust. Doors open at 6:30, presentation at 7:00.